Usually I have some idea what I’m going to say before I say it. Right now, I feel at a loss for words. If you knew me, you would mark this occasion as rare and perhaps even laugh at the very suggestion that such a thing could be possible. Still, I find it difficult to know where to begin when I haven’t fully settled on how much I would like to share about myself. It occurs to me that it is not necessary to divulge my history but rather to dive into the present. I have a struggle. Perhaps we share it? I have an unhealthy relationship with food and as a result, today I find myself overweight. It doesn’t matter how much extra weight I have at this point. You only need to know that it’s there. While I have approached this problem over the years from countless angles (with mixed results), I am attempting another. My tower of impossibility was food. Brick by brick, I imagined myself dismantling the food tower and using those same bricks to build a walkway of prayer, paving the way to victory. Zondervan (2010). Made to Crave: Satisfying Your Deepest Desire with God, Not Food (p. 30). Zondervan. Kindle Edition. Prior to this, she described praying each time she craved something that wasn’t part of her eating plan. If you struggle with food, you have a clear understanding of what it means to crave something. I pictured this tower of impossibility and thought that I needed to tear down my tower as well. That’s when the idea popped into my head. 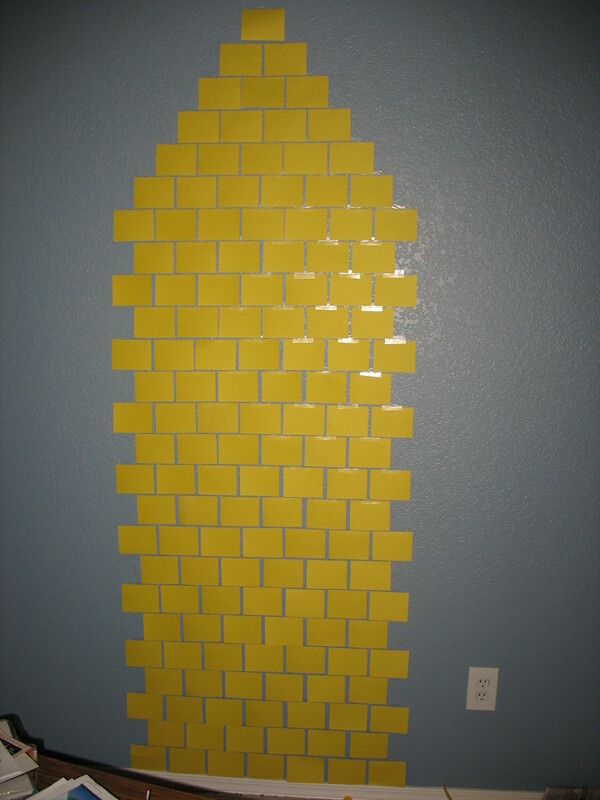 What if I could construct a “tower” on the wall of my office? Each time I turned to God for help, I could remove a brick from that tower. I’m a visual person. I love charts and graphs and reports. This tower idea excited me. At first I tried to over complicate things. I wanted to use specially colored index cards (that I would have to go purchase) and sticky tack (also needed to purchase). Before I knew it, my struggle with perfectionism put off the project until a time could be found to make a run to the office supply store. Thankfully I realized what was happening and told myself to stop being ridiculous. So I set to work, making use of what I already had. I gathered several sheets of yellow construction paper (9×12). You may be questioning my choice of color. Well, that’s the color my kids use the least so I have more of it than any other color. I cut the sheets into 3″x4″ rectangles. Then I began the tedious process of taping them to a wall in my office. In my messy office taping paper “bricks” to the wall. 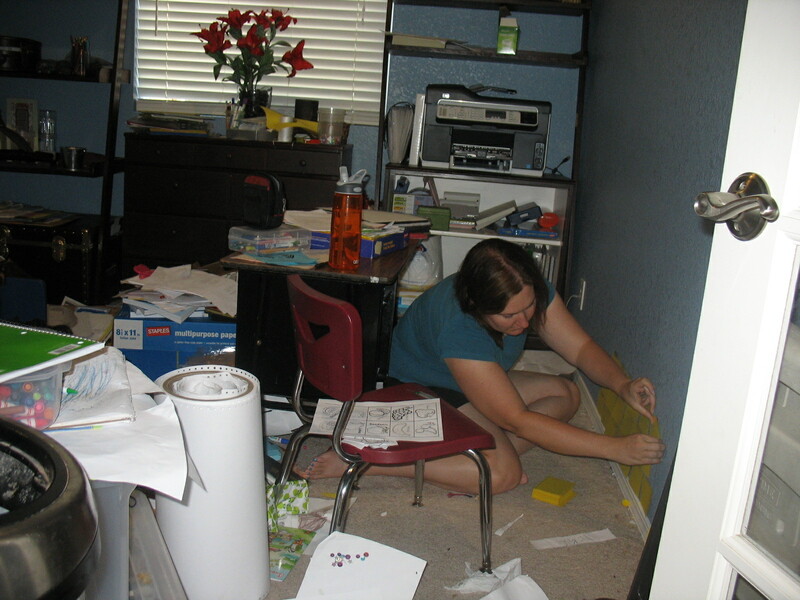 I mentioned that food isn’t my only area of struggle, as you see in the photo, my office is a disaster area. This room is not representative of the rest of my home (thank goodness) but it is a telling barometer of what is going on inside of me. I’m hopeful that over the weeks to come I’ll get my office back. I did have my youngest child (who took most of these pictures for me) snap a few other photos of the office to use for “before” examples later. 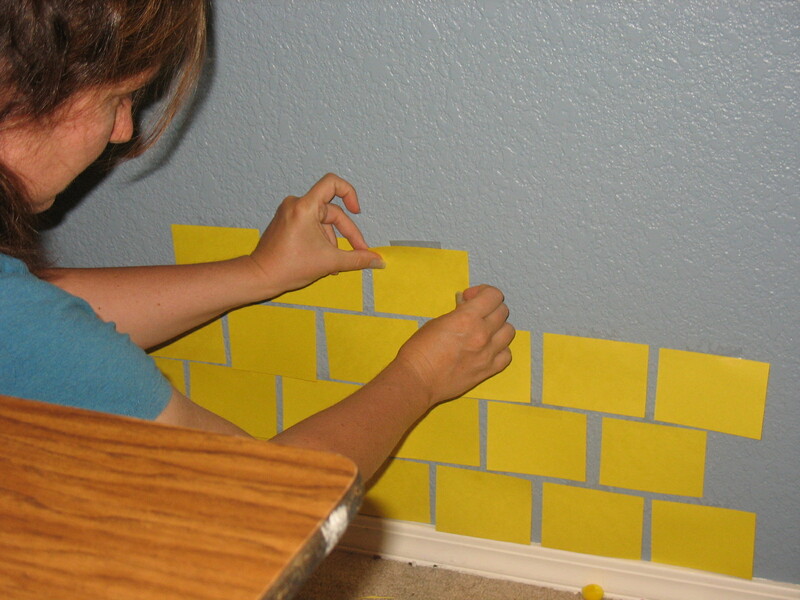 Yesterday I wasn’t able to get all of the “bricks” taped up so I finished the task today. My kids came in and asked what I was doing. I told them, “I’m building my tower of impossibility.” Everything I have found it impossible to overcome is represented by this paper brick tower. I don’t know that they “got it” but I’m hoping they’ll see some positive changes in their mom soon. I can remove a brick when I turn to God for help with this area of struggle and as a result I make the better choice. I must replace a brick if I lose the battle and misuse food (notice I said “battle” and not “war” – I can lose a battle and still win the war). This post is where Brick by Brick began. I learned so much as I took down those “bricks”. Now I do “virtual” bricks by putting my posts into the “brick removed” category. The scenery of my journey has changed over the years, but my hope in the Lord has not. Fantastic idea. I hope I can keep up w you.